Provide your staff with a versatile, highly efficient knife like this Choice 8" chef knife! Thanks to a professional-grade, high carbon 420 stainless steel blade, this 8" chef knife serves as the perfect all-around kitchen utensil. Hand-honed edges are designed for maximum cutting performance that produce sharp, unparalleled cuts each time, while the ergonomic polypropylene handle provides users with exceptional comfort and a safe, non-slip grip. I needed some extra chef's knives for my kitchen and these fit the bill perfectly. Anyone looking for a quality, inexpensive knife who doesn't care about branding needs to get this knife. Easily sharpened and cleaned, this knife has become a workhorse in all types of prep. The handle seems to hold onto color fairly easily, but a little bleaching should do the trick to strip the color. So i have all good things to say bout this knife. Excellent for dicining veggies and slicing cheese of meat nice and thin. Comfortable grip handle and affordable. I've bought several paring knives that were an epic fail when it come to peeling potatoes or turnips. I have rather small hands and most either had too big of a handle and/or the blade was too dull.......making the task awkward, uncomfortable, and unsafe. This little knife is super sharp and small enough to make quick maneuvers around your spuds. Such a great knife. It cleans really well, particularly the white handle. Holds up well in an industrial dishwasher. It comes pretty sharp and holds it sharpness over regular use. Well satisfied. This knife has been a great addition to our kitchen and it can be used for a variety of things. Our chefs have been pleased with the quality and we plan to purchase again. Decent knife for the price. Arrived very sharp from the factory, but doesn't hold its edge very long. We have mainly been using it to cut stacks of tortillas for chips. This knife is great for everyday kitchen duties. Slicing produce, cutting proteins etc. 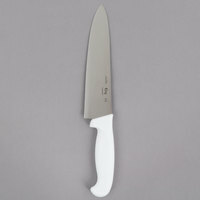 The 8" size is the most commonly used knife in our kitchens. This choice 8" white chef knife has been a great addition to our restaurant cutlery. We use for daily preparation and would purchase this knife again. We love these knives! This particular size is our favorite. They last longer than expected as long as they are sharpened on a regular basis. This knife has a great feel and weight to it. It arrived with a sharp blade and seems to be made with high quality materials. This is a great quality knife that comes sharp right out of the package. The handle is well attached and will not slip from your hands. I would recommend it. This Choice 8" knife is a great economic choice, its low price means you can use it for more tasks and don't have to baby the blade. The edge is fairly sharp, but the blade thickness does hinder its ability to slice like a laser. All in all, still an excellent kitchen knife. Excellent choice for a chef knife. I have never used an ultra expensive knife for comparison, but these hold a good edge and act as a work horse of my kitchen. I use them, put them in the dishwasher, and continue on. Works well but cheap enough to replace when needed. Nice sharp blade and with an easy to hold handle. Just the right thickness to the blade. Plastic handle great for when pulling out of dishwasher. great knife for its price. if you take care of it well will stay for long. I use it every day for 2 month and works fine. don't wash it in dishwasher. quality of plastic is ok. for that price I do recommend it. Perfect Knife, the size is great, really works amazing the high carbon knife blade is really good, really strong and has a really good shape, cuts everything!! This is a good knife if you want a lighter handle. After many uses, the blade has one rust spot on it, but that can probably be bugged out. i bought this 2 times and the first batch had a narrower blade than the second purchase. Both are sturdy blades for everyday use. I prefer the narrower blade for most uses though. Keeps a decent edge and easily sharpened. I bought two of these to keep around the house as beater knives based upon other reviews. However, after the first time washing the knives they already began to rust. Normally, after washing my knives I always make sure to immediately dry them but I was in a rush and simply left them on the towel to dry. I'm glad I did because now I know that these knives are not what I expected them to be. This knife cuts like a dream. Goes right through everything and feels very comfortable in my hand. Love the look and finish on it too. This knife is great for chopping vegetables and cheese; the blade is very sharp. The grip is comfortable and it is very durable and easy to clean. The knife is a little long for me, but I just have small hands. I do like the nice grippy handle and the fact that it holds an edge well so far. This is an excellent quality knife for a very reasonable price. It cuts well and it stays sharp. Every restaurant should have at least two of these. Very good quality, especially for the price of this knife. We use them daily in our busy kitchen and go quite a while between sharpening, as they keep their edge. White handle is easy to clean. I am impressed with how long these have lasted, 18 months and going strong! The blade is long enough to get the job done, but not so long that you are afraid to use it. Great little knife for minor cutting. I would not suggest it for real slicing, we have a slicer for that. But it works great for salad lettuce and precut tomatoes. This 8 inch chefs knife is an amazing all-purpose knife. It's very sharp and sturdy and I love the size. As for the price, you can't find it for any less anywhere else. The 8" chef knife is a great tool. The handle is easy to hold and the knofe has kept it's edge really well. Would definitley buy again. You get what you pay for in these knives. They stand up well to heavy use, but don't hold their sharp edge as well as their more expensive competitors. A good knife for the price. This is a great chef knife with a poly handle. I like how the handle feels and fits in my hand, and the blade is easy to sharpen and stays sharp for a relatively long time. Great value. These are a basic 8" chef knife, but for the price they are great for almost any kitchen. They are durable and inexpensive. A must have for most kitchens. A nice economical chef knife with an 8 inch blade. We bought a dozen of these to have at each station of our cooking class. The knives are strong and durable and chop vegetables perfectly. I was looking for a cost effective knife that my staff could use and abuse and if it only lasted six months I would not loose any sleep. This does that job and several months later and many re-sharpenings I am still pleased with the performance of the blade. Great knife. Super sharp. Cuts through tomatoes smoothly. Nice looking, sturdy and very comfortable handle. I would definitely recommend this knife for your kitchen. I will be buying more when needed. Has a nice handle for easy control. There is texture on the handle so it won't slip. Sharp and easy to clean. Just what I was looking for. I bought this because I have some cooks that are just learning knife skills and how to sharpen knives, I figured if they messed up this knife I wasn't out a lot of money. It is a good knife for them to learn skills on it's not the greatest for finely shredding cabbage or lettuce since the knife is thick but it works well for chopping, slicing and dicing everyday things in a kitchen. It is also surprisingly durable for the price. not the fanciest knife in the world, but this is the true work horse of most professional kitchens. it's sharp and the handle has a great grip. it's a great all around knife for bulk tasks. I wish I had measured 8" before we purchased as this knife is HUGE. Straight out of the box it was easy to quickly wash and put to use. It sliced chicken with ease and made meal prep extremely easy compared to our other dull knives. Great addition to the kitchen. Especially good for chopping smaller vegetables and fruits. Not my go-to chef knife because it is a bit small for me, but I appreciate having a smaller size around for more delicate tasks. Very nice chefs knife at an amazing price. Ive had my 40 dollars knives that dont stay as sharp and doesnt cut with ease as this chefs knife. Great knife. Feels great in your hand and has a thumb groove that is nice. It arrived very sharp and was put to immediate use. Would buy again. 8" is an excellent all around knife. The knife stays sharp for quite a while, but keep in mind it is helpful to have an honing rod and also a knife sharpener handy. I like to use this size of knife for slicing steaks and chicken on a cutting board. After some sharpening and maintenance this knife is fantastic for every day use. I switch off between this knife and my mercer chef knife. It's a good quality knife for a cheap price! It stays sharp for long periods of time and the handle fits well into my hand. I don't have any slippage issues. Highly recommended! I love this knife. It's incredibly sharp, durable, and has a great handle. It's also a complete steal at the price you have to pay. I own the not only this 8" but also the 10" version. Very well made and high quality. It also is easy to keep sharp as well as sharpen. Great for all purpose use. We used to spend a little more on community knives, but sure enough they always get chipped or dent, so we got this guy instead. Surprising sturdy and easy to sharpen. We even both a second one shortly after. Great buy. These knives are so great for the kitchen. As long as you keep them sharpened, they are so easy to use. The handle has a comfortable grip as well. This knife is a perfect standard size for a chef knife. Easy to hold and it cuts through anything like butter! i love it. Buying more soon! Standard 8 inch chef's knife works particularly well in a commercial kitchen. The white handle is very comfortable with an ergonomic grip for longer use. The only problem I have with this knife is that I did not order a larger blade. Overall, great knife, very sharp and the handle feels comfortable does not slip while holding it. Nice job, guys! This is a good cutting knife right out of the package. It holds it edge well and feels nice in the hand. I would recommend. Large chef's knife that cuts well right out of the packaging. The handle is plastic and the blade has a nice weight to it. Not too heavy though. This is definitely a must have for budget-conscious operations. Strong, durable, easy to sharpen, easy to clean and cost-effective. We will be back for more! I bought these to replace the "church knives" at my church. For those of you not familiar, "church knives" refers to a special breed of cutlery that, across the board, has the sharpness level of a beachball. This is an economical way to keep a safe tool at hand. 4-stars for the fast-dulling soft steel, but this makes them easy to sharpen, so it balances out in the end. Prone to spotty rust, but not if properly washed and dried regularly. I would recommend this product. These knives are great quality for the price paid. They are sturdy, sharp, and easy to use, and it was easy to train volunteers in knife safety with these. Great utility knife. We use it for many purposes from chopping veggies, to slicing cheese, to cutting bread sandwiches. Knife has a sturdy handle ad a great blade. I needed a new knife I wouldn't mind using in my home business. It is a good knife. The only down side (and reason I gave it only 4 stars) is the handle. It feels bulky and awkward in my hand sometimes. It cuts through onions smoothly, and the price was great. A good size chef knife. The construction makes it easy to clean and being a chef knife it has very many uses. It is comfortable when using for a long time. I love this knife. It's super cheap, but is a chopping machine. Plus, if it gets dropped it doesn't make me wince like when it's one of my good knives. Probably be buying more of these. This knife is great for the price. it easily competes with more expensive knives. The handle is comfortable and the blade is sharp. Not to mention it is easy to clean. Man oh man I use this knife in my kitchen a lot. It doesn't get dull and very easy to clean. It also fits in my knife station easy. This 8" chef knife is a great product. The handle is very comfortable to hold, making cutting simple. The knife is sharp and does a very precise cut. I needed a good, sharp knife and this one is great. The handle feels good on the hands and the knife is thin and sharp. For the money, its much better than a lot of the more expensive knives I have. Hand wash and be gentle and it will last longer. This chef knife is a great buy! It's good quality and stays sharp. The white handle has a great grip. It's perfect for chopping vegetables or various meats. These knives are super functional. They're sharp and dishwasher safe with a strong handle that won't slip. They won't win any beauty contests, but that's not what they are made for. Basic 8 inch chef knife. Nothing fancy but does exactly what I need it to. Great price for the quality. Will purchase again in the future. Excellent knife, comes very sharp! I love the plastic handle verses a wooden handle. It just feels cleaner than a wooden handle. This is a great sized chefs knife. I ordered a set of these knives for my students to use in an introduction to cooking class. The blade is well made, but not exceptionally sharp. It sharpened really easily though and was just right for our use. If you were to use it professionally, I'd probably recommend a higher quality knife, but for casual use it's great. Great product! Item came exactly as described and shown in the pictures. Its a quality product for a great price. This item is worth buying. Excellent Quality knives. We have been using this for a little more than 5 months now and it is still in great condition. Can't beat the price! Purchase a low cost knife sharpener as well to keep them lasting long. This eight inch chef knife with white handle is great. I bought a couple of these and everyone who uses them loves them. Great Purchase! These Knives are great for all day prep. The light weight & sharpness saves so much energy and wear on your wrists after a long day of prepping. I was surprised at how sharp that this knife stays! It has a good weight to it and is a perfect addition to every kitchen. We really like these knives. They are a nice weight. This knife is my go to knife for almost everything. They are easy to sharpen. What can I say? This knife is inexpensive but it does its job. It isn't as sharp nor does it hold an edge as long as blades with better quality steel. I wasn't expecting anything great when I ordered these, as they will be used mostly for our more inexperienced employees, or those who have no need for an expensive knife. This is a high quality knife for the low price. I purchased these for the kitchen prep area for meats and large fruits. Very impressed with sturdy handle and great looks, highly recommend and will buy again. Great knife. Came with a good edge. These are almost disposeable but who cares. Great price. Actually impressed with these. Will definitely buy again. Thanks. I use these knives in the kitchen after the store opens. Employees have a tendency to grab tools without considering who they belong to, so my knives get locked away after I am done with my preparation. These knives are functionally sharp when they arrive. They hone to razor sharp very quickly. I routinely sharpen and hone all knives every Sunday, but these have only needed to be touched up once per month. We use them to process chicken, ham and turkey for our product. The handles remain non slip during greasy work. They clean up easily and have the ability to withstand the abuse of a clumsy prep cook. Good utility knives for a kitchen! A great knife at a great price. It is not the sharpest knife but at 8" it is good for slicing melon or larger fruits. It also cleans easily. these knives are nice , but they are not sharp enough the handle is solid and has a good grip on it they do the job.